Do you want to build your own ambilight, but you don’t know where to start or what to buy? In this tutorial I’ll try to cover what parts I brought for my build and how I configured the software. While I’m still not done creating a 3D-printed case for my Raspberry Pi and providing it with an ordinary power supply, this guide should help you a long way. There you go! Hyperion is installed and you almost done with the software part. Before you’ll be able to test or use your LED’s you’ll have to configure Hyperion. The good thing is that it has a pretty good utility to do that. Just download HyperCon.jar and run it. If you haven’t mounted the LED’s to your TV yet and want to try them out to see that all of them light up, you can change “Horizontal #”, “Vertical #” and “Bottom Gap #” just so you match the number of LED’s you brought. You’ll see the number of LED’s in the right bottom of the screen. You don’t have to worry about the other settings for now, just hit “Create Hyperion Configuration” and save it somewhere. In order to copy the file to the Raspberry Pi, you’ll need to know its IP-address and use WinSCP or similar to copy the file over. I’m not going to cover the basics here, just connect using SCP, its IP and Pi/Raspberry as username/password. Once logged in, upload the file to “/opt/hyperion/config/”. Reboot your Raspberry Pi and you should see all light light up when it has finished booting. If you want you can also remote control it using the Android or iPhone app. If you have done everything right it should work pretty nicely. 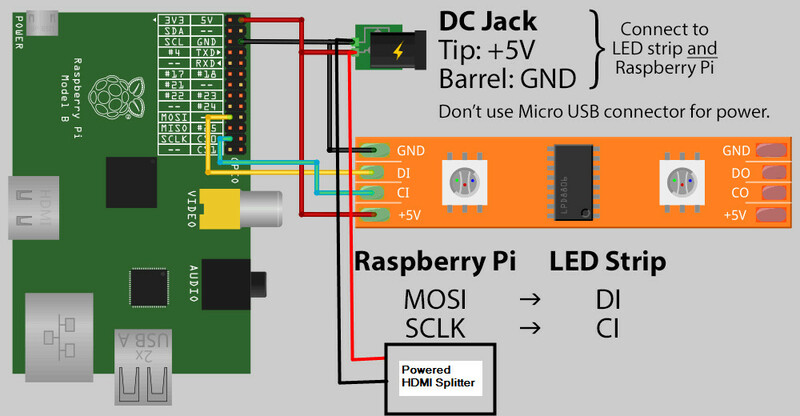 Connecting power to the LED’s and Raspberry Pi might be a bit tricky, at least to explain. For now I’m using an old PC power supply because that’s what I had lying around. What I did was to remove the black and red wire from a Molex connector as this will give me access to the 5v I need to power both the Raspberry Pi and the LED’s. Next I used a wire connector to connect the black wire to the Raspberry Pi and to the LED strip. Follow this image from bite-in.com and be careful that the colors of the wires may differ (the black wire on my LED strip wasn’t ground). Red (5V) goes also to both the LED strip and your Raspberry Pi as the image illustrates. Now there are only two cables left from the LED that go to two of the GPIO pins of your Raspberry. I highly recommend to watch this video on YouTube. There’s not much more to add, just take your time and don’t rush it! It wasn’t that hard. Direction: Depending on where you started, you might have to change this. Horizontal #, Vertical #, Bottom Gap # should match the number of LED’s you have. 1st LED offset: Use this to set the offset so that LED 0 is where the LED strip starts. Make sure that the preview-image on the right matches your TV, then save the configuration and upload it to your Raspberry Pi. Now you just need to reboot and you’re done! Now you can install the XBMC addon following this guide and everything should work. Will this work with Plex for windows? I’m currently using Hyperion to control my ambilight. As far as I know there is no Plex support yet, but I guess it could be implemented rather easily. You could also use Plexbmc addon for Kodi/XBMC to tunnel Plex through XBMC and then you have native support for ambilight through the hyperion xbmc addon. I’ve also tried to use a USB video grabber in order to be able to use the ambilight with any HDMI source, but the quality and lag were too noticeable in my opinion. You can read more about that here.